Saw this first on Curbed SF — Google maps now displays color-coded BART lines, along with the Caltrain line. Apparently the San Francisco Bay Area is the first metropolitan region to get this feature. Click the thumbnail to go to Google maps and see the BART and Caltrain lines (the latter being the grey line going down the Peninsula, of course). However, the feature only displays a straight-line route map from station to station, often distorting the actual location of the route taken between stations. See after the jump for an example. This news is just popping up now, but Johannes Mehserle, the officer invovled in the BART shooting and killing of an unarmed man (previously discussed here and here) has been arrested in Nevada on Murder charges. The Mercury News has more info, but not much though I’m sure more will surface soon. Apparently this just happened this evening so more updates to follow. Mehserle, 27, was taken into custody in Douglas County, Nevada, said Deputy Steve Velez of the Douglas County Sheriff’s Office. The arrest was also confirmed by David Chai, chief of staff to Oakland Mayor Ron Dellums. Mehserle was arrested in connection with an investigation by the Oakland Police Department into the shooting of Oscar Grant, 22. An Alameda County judge signed an arrest warrant, and Mehserle surrendered without incident, authorities said. Douglas County sheriff’s officials refused to disclose what crime Mehserle was accused of committing in the arrest warrant. Deputy Velez said Sheriff Ron P. Pierini would make a statement on Wednesday. So according to them it’s not officially murder charges yet, just in connection to the shooting and the actual charges will be announced in a press conference tomorrow. BART closed its investigation today into the police shooting of an unarmed passenger in the early hours of New Year’s Day without any testimony from the police officer who shot the man. Former officer Johannes Mehserle, who resigned from the force last week without ever talking to investigators, claimed his 5th amendment rights against self-incrimination. Meanwhile, California Attorney General Jerry Brown assigned an investigator to the case. A demonstration last week in Oakland turned violent, with 120 people arrested, several cars burned, and storefronts damaged. Demonstrators were gathering at this hour in San Francisco for another demonstration. (The last link courtesy SFist.) Update: The SF protest was relatively peaceful, with no arrests. You can read the somewhat juvenile account by a demonstrator on Indymedia. Update to the story below as of 1720h PST: The San Jose Mercury News is reporting that with 9800 ballots remaining, Measure B has passed the 66.67 percent mark. The ballot initiative to fund a BART extension to San Jose may have squeaked by, KNTV was reporting this afternoon. Though initial balloting showed the measure falling short of the required two-thirds majority, mail-in ballots are turning the tide. With 17,000 of 42,000 mail-in ballots still to be counted, the vote to fund the 22-mile BART extension with a 1/8-cent Santa Clara County sales tax was 66.61 percent yes; the measure, like any tax increase in California since the 1978 passage of Proposition 13, requires at least a 66.67 percent yes vote. If the Bart-to-San Jose tax passes, it would complete a surprising trifecta of voter support for mass transit projects at a time when local and state budgets are tight. Earlier this month, voters in Marin and Sonoma Counties passed a rail initiative, and statewide Proposition 1A also passed, kicking off the state’s bullet train project. Tough times can occasionally mean good deals for some, and a large commercial property investment group has decided to take control of almost 2 million sq feet of downtown Oakland office & commercial space . While the deal does not actually include all of Oakland, the CIM Group has closed a deal buying the city’s tallest office building at 1 Kaiser Plaza as well as several other marquee commercial properties. Amongst the buildings acquired were 1333 Broadway which is a ten story structure that encompasses the entrance to 12th St City Center BART Station. With these purchases CIM Group now surpasses Walter Shorenstein’s legacy real estate company which owns approx 1.5 million square feet in the downtown Oakland market. The LA based CIM group initially took a giant toehold when it bought Oakland’s largest downtown hotel the 20 story City Center Marriott and it’s sister property The Courtyard in 2007. CIM Group in an effort to drink it’s own kool-aid, will move it’s Bay Area HQ from SF to Oakland in 2009, and run it’s operations which specialize in urban properties, including revitalized icons like Grauman’s Chinese Theater and the adjacent Hollywood & Highland complex. Today C.W. Nevius has a column on the latest, scariest crime to hit Glen Park: the carefully planned robbery last Friday night of Buddies Market, and the brutal, gratuitous attack on the store’s owner, Paul Park, who survived — just barely. Glen Park has been subject to a wave of robberies in the past six months, mostly random street muggings. The reasons are obvious to anybody who spends as much time there as I do: BART station, freeway on-ramps, and residents who generally have iPods or laptops with them. Residents, I might add, who are smart enough to hand the goods over without a fight. No wonder predators are drawn to the neighborhood from miles away. Nevius writes of them: “No one knows who they are or where they are coming from.” Technically true, but residents have their suspicions, and unlike Nevius I’ll tell you exactly what they suspect: thanks to BART, the sociopaths living in Oakland and Richmond are right next door. What with the downturn in our economy, it’s likely that this is a problem that won’t go away. The solution to this problem is obvious: a small number of officers in conspicuous locations in Glen Park during the times of greatest risk, from about 8:30 PM until 1:00 in the morning, especially on Friday and Saturday nights. How difficult could it possibly be to protect the residents of Glen Park from these crimes? Captain Denis O’Leary of the Ingleside station claims his hands are tied, but give me a break. You don’t need to mobilize a riot squad. He has 109 officers. The presence of a single police vehicle parked in the bus stop at Diamond and Chenery, with two officers nearby, from 8:30 PM until 1:00 AM every night, and two more officers conspicuously posted outside the BART station at the same time, should be enough to deter most of these crimes. We’re talking about four officers at most for nine hours a week. Was a police car posted there last Friday night? Somehow I doubt it. Maybe this isn’t a good long-term solution, but as an emergency measure? Seems like a no-brainer to me. The Glen Park Merchant’s Association has started a blog so that residents will have a place online to discuss the problem. The president of the association has started a fund where you can make donations to help with Mr. Park’s recovery. With the District-wide tax base thus weakened by the withdrawal of San Mateo County, Marin County was forced to withdraw in early 1962 because its marginal tax base could not adequately absorb its share of BART’s projected cost. 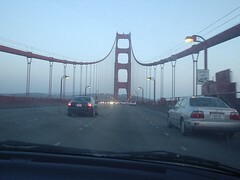 Another important factor in Marin’s withdrawal was an engineering controversy over the feasibility of carrying trains across the Golden Gate Bridge. Anyone from Marin? Care to respond? p.s. Tipped off from N-Judah Chronicles the other night on the history of Marin’s lack of fair play in the Bay Area transit game. Congrats on Best of the Bay! May 15th was not only a “Spare the Air” day and “Bike to Work” day; it also was a day of record temperatures in The City. As the day went on, the heat soared to 97 degrees in the city. As noon approached, trouble began to brew on the BART system. For the next 8 hours, the system was plagued by delays of 45 minutes or longer. I met the BART problem head-on at rush hour last night. I arrived at Civic Center at about 4:40pm. Trains were being held in between stations and at stations for 10 to 15 minutes at a time. The first train only went to 24th street/Mission, so I didn’t get on. Then I realized, soon enough, the trains were ONLY going to 24th Street/Mission, where you would have to transfer. 17 minutes later, two more trains came and went, absolutely packed to the ceiling. Finally, I got on a train. At 24th Street, something strange happened- the train went backwards. Apparently, while I was zoning out in iPod land, the train had suddenly become a Richmond train and just started going the other way at 24th Street. At 16th, I disembarked to attempt another try towards my destination. Alas, my “SFO” BART train, again, suddenly became a Richmond train and turned around. But, at least, this time, I managed to GET OFF the train at 24th. The platform was packed with people, the trains kept turning around. Then two more packed trains rolled by. Finally, I braved one of the packed trains. My last BART train of the evening made several long pauses to cool itself, but I did finally make my destination at 6:20pm. A Companion for Your Commute? There is a reason I carry a camera in my bag every day. I have three digital cameras, constantly charging, of various sizes, on the ready to capture news, odd sightings or anything in my path. This is Mia, and she sells rats in BART for $5.00. As I exited the Embarcadero BART/Muni station, contemplating my public transportation frustrations, I noticed the spectacle pictured above. At first glance, I thought nothing of it. I remembered the construction walls were up for the better part of the year. Once I realized the change in scenery, I hopped down the escalator (I was going up) to snap a a picture. It seemed like the light at the end of a very long tunnel. And then I thought of how much better life would be if Muni would invest just as much into running their trains on time, or having an adequate amount of trains during rush hour. Of course, being from the South (as in Southern California), I really can’t complain about public transportation. Muni is by far the best in comparison. The real bright side is that this might mean the lines will probably lessen a bit aboveground! Check out the San Francisco Business Times article if you’re not hip to the BART/Peets news.